The White Ribbon DVD Review The White Ribbon is a taut, measured and ultimately disturbing film, in which stellar cinematography and unsettling performances combine to produce a mystery possessed of real dread. Winner of the Palme d’Or at Cannes and the 2010 Golden Globe for Best Foreign Film, Michael Haneke’s latest film The White Ribbon is another accomplished, atmospheric entry into his Euro-arthouse oeuvre and further evidence of a director at the height of his cinematic and storytelling powers. 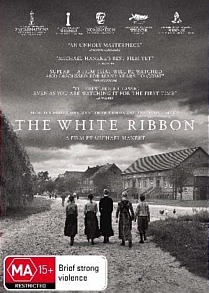 Set in the small German village of Eichwald and narrated at a distance of many decades by the former schoolmaster, The White Ribbon takes place in the years immediately preceding World War I and sees a simple farming community beset by a series of sudden and violent incidents. As the story unfolds it becomes apparent that Eichwald’s seemingly God-fearing and well-mannered children are somehow at the centre of the calamities, though as ever with Haneke nothing is ever simple. This isn’t Children of the Corn, and in concordance with the film’s complex themes the director prefers to reveal his hand one card at a time in the form of subtle hints as to intent. ‘By retelling these events,’ states the narrator at the start of the film, ‘perhaps we can come to some understanding of the events that came later.’ The White Ribbon is a taut, measured and ultimately disturbing film, in which stellar cinematography and unsettling performances combine to produce a mystery possessed of real dread.